Replies: 6 (Who? ), Viewed: 5158 times. #1 26th Feb 2007 at 1:57 PM Last edited by niol : 24th Oct 2007 at 4:44 AM. Fence-arch is so much alike fences in terms of graphical contents like cres, shpe, gmnd, gmdc, txmt, txtr, lifo. But, it has no fence xml file. 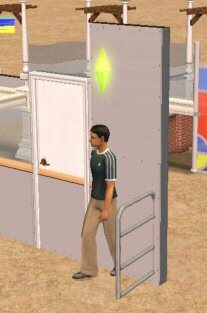 It's graphical references are mostly linked through its script fencearches.txt @ "...\EA GAMES\The Sims 2\TSData\Res\Catalog\Scripts". "26" appears the numeric instance of the fencearch. All the model statements are to link to the corresponding cres files. 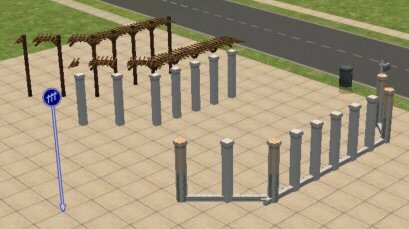 So, the only fencearch consists of 4 components, 1 for the post, 1 for the central rail, 2 for the rail sides - "east" & "west". The side models appear to be located at the same spot as the post model. catalogTextIndex is to tell the UI to show up the "relevant" infos about the only fence-arch and probably UI-enable the only fence-arch. "mayPlaceDiagonally true" can enable fence-arch to place diagonally. Yet, the meshes of the only fence-arch wasn't designed for this purpose. 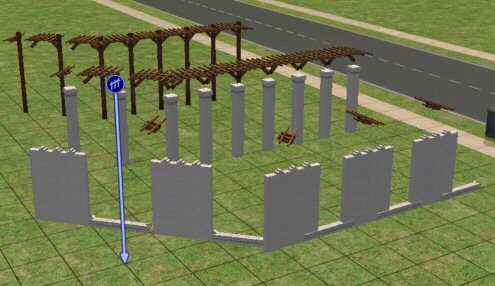 I've used in-game fence posts and diagonal rails to make the "new" fence-arch in a TS2 only system. These 2 are the 2 modified scripts I did before I took these screenshots. I also use it for custom-cloning. I've yet to prove if certain location(s) or no location will work for custom cres files. If custom cres will work out, more better crafted custom fence-archs may come out. They can overlap with partitions like fences but cannot be placed unless a grid away from any wall-based partition. Diagonal versions may help solve the challenges caused by the particular partition system for fence-arch. Is it possible to add bhavs & pie menu to a fence? What're the known links or references to correlate bhav, pie menus, OJBD, audio references, etc? - then release the mouse button and a WestTrellis (with post) is created. But now, I couldn't see any TrellisCenter in my tests, or anyway no fence-arches built that way: every tile is identical to the surronding ones. #3 26th Feb 2007 at 4:44 PM Last edited by niol : 26th Feb 2007 at 7:11 PM. I'm lost... What's the exact problem(s) you're trying to describe? This is true in TS2 and up to OFB at least. In the pix, the one with wedding-arch and a shiny ending fence-arch side is the custom fence-arch! To test this example out, one has to dump the custom package in the downloads folder and replace the fencearches.txt @ the script folder. All fence-arches are at the end of the fence listing. It seems the script text can't recognise the FR or any other location probably because their default location for build tools and/or other in-game graphical elements is 0x1C0532FA. 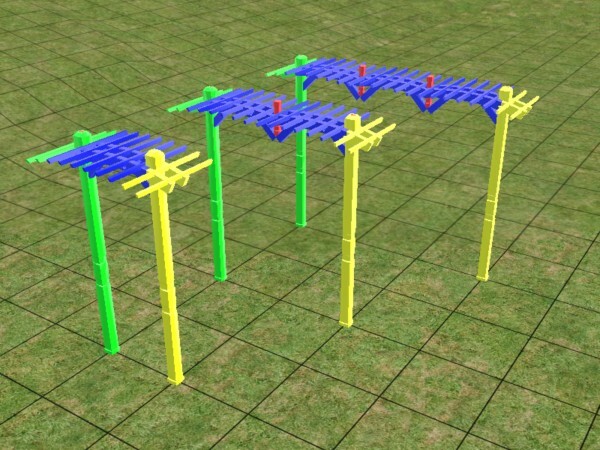 As hinted by TS2-compatible fences, fence-arches get recognised in the same manner. So quite likely, at least custom cres files have to have group strings as 0x1C0532FA. I've not tried to test if shpe files have to follow cres files in this manner, but I don't see that as important any more. after all, the gmnd, gmdc, txmt, txtr and lifo can be in FR . #4 27th Feb 2007 at 1:15 AM Last edited by Numenor : 20th Nov 2008 at 2:05 PM. Lol! 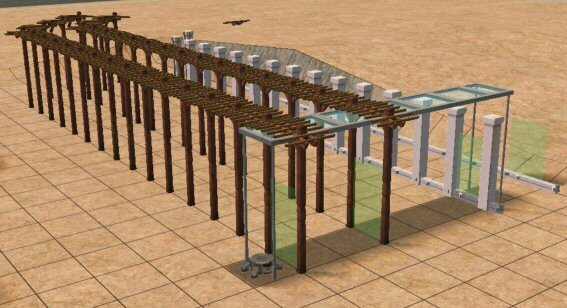 I guess I wasn't clear earlier, and anyway I was wrong: the fence-arches are modular, and work exactly as they are supposed to. I'll explain better (not for you, Niol, but for anyone else might want to read this notes). All the pieces are visible in the catalog thumbnail (see screenshot below; again, the red post is not visible because hidden into the terminations). 1) Fence-Arches can have a custom price, catalog name and description. Note that the number 255 must not be modified: it refers to the instance 0xFF of the text list; as for the ExactPackageName, it's the package that contains the fence and the TextList 0xFF (omit the .package extension). 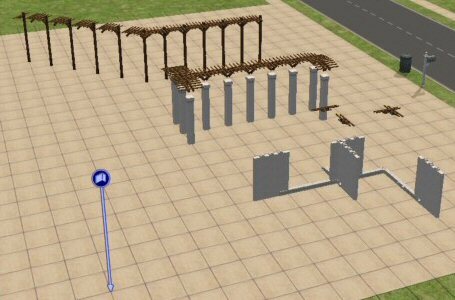 2) The Scriptorium CAN be used with the fence-arches; but at the moment it's not complete. You have to edit (only once) the file "fencearches.txt", appending to it the line: wildInclude "Scriptorium_Walls-Fences-Arches\*. *" (included the quotation marks as shown). Once done that, you can put the text files containing the data for your custom FenceArch into the folder "Scriptorium_Walls-Fences-Arches" (you can access it using the shortcut placed in your Downloads folder). 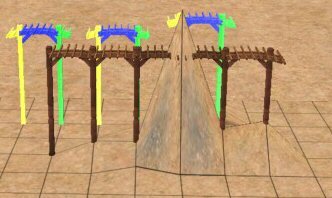 This makes much easier to add and remove custom fence-arches. 3) In my tests, so far, I've observed that both the CRES and the SHPE must be in the global scenegraphic group 0x1C0532FA. All the other files (except, of course, the Text List) can be assigned to the private scenegraphic group 0x1C050000, and referenced using the Forced Relocation. I'm attaching the rar containing my test fence-arch (the coloured one, depicted in the screenshots) and the TXT files ready to be put in the Scriptorium folder. #5 27th Feb 2007 at 3:59 AM Last edited by niol : 27th Feb 2007 at 5:11 AM. The post and the side locations are overlapping as it was planned, and that's what I meant "The side models appear to be located at the same spot as the post model." 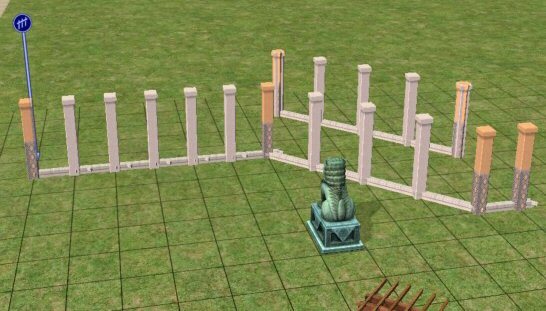 Normally, if the meshes of the East and west are the same as or larger than that of the post, they're likely to cover the post (as shown in some of above pix I posted, especially the ones about the WhiteRoyalCourtyardFencing posts). The posts get covered at the terminals. The east and west parts only exist at the terminals. So, a directional fence-arch is possible. After all, some cool designs can be done out of this overlapping property. Thus, we're basically talking the very similar thing in this aspect. 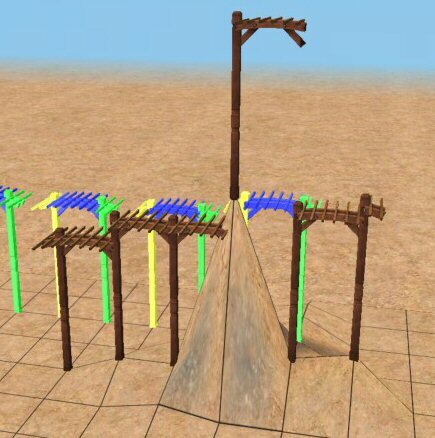 So, meshers can just build them up to the parts @ positions similar to the default ones for the parts to connect while saving resources. 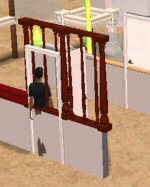 Sure, do whatever you want with my test fence (that btw has the post shorter and thinner then the east/west, like you describe). I'd like to know if there is a way to make the fence-arches "climb up" the hills, like the black iron fence; currently, it cuts the ground, making it flat, like a wall. #7 27th Feb 2007 at 10:13 AM Last edited by niol : 1st Mar 2007 at 4:59 AM. OK, anyone is up for a tech challenge to alter that? Sorry, I forgot about the another statement completely after getting too excited about the custom fence-arches..! 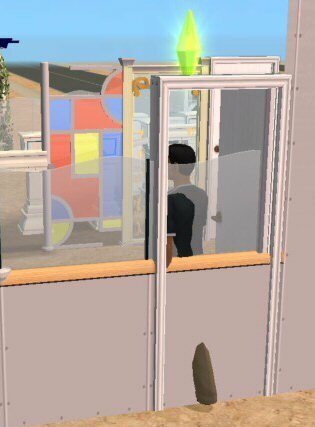 This message has been deleted by sims2lurker.